If you’re looking for a corporate gift then you’ve come to the right place. 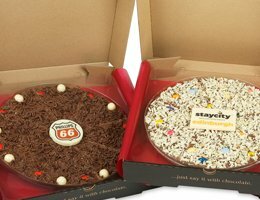 Our chocolate pizzas and gifts are unique, delicious, and they make a smart business option as they can be created bespoke for you. We can customise the flavours, brand the packaging, and add a personalised plaque to our pizzas with your company logo. Call us on 0115 989 4254 to discuss all your corporate gifting needs. It’s important to get your corporate gift just right, what you choose to send will say a lot about your business. You might not realise it but sending a corporate gift is an important business decision that you should take the time to consider carefully. If you’re sending a gift to all of your staff to say thank you for your hard work, you need to think about the expense. We have some great bulk offers that will help make a gesture but won’t cost your business too much. For those of you sending a gift for someone who is leaving or going on maternity leave, you might want to personalise it with their name and show some thought went into the gift. If it's a gift to your client, likewise as with your staff member, you want them to know you haven’t just sent gifts in bulk, you have thought about them individually. Personalisation will help you achieve this. 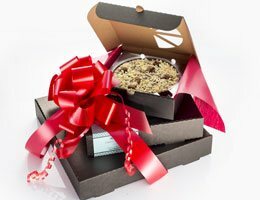 Finally, if you’re sending a gift to a company you are hoping to build a relationship with, you want to make your branding stand out and give them something unique that they’ll remember. Our chocolate gifts are unique. The designs stand out the second you open the box and we have invented our own unique gourmet flavour combinations that taste incredible. Our chocolate is rich in cocoa and quality and this will be noted by your recipient. 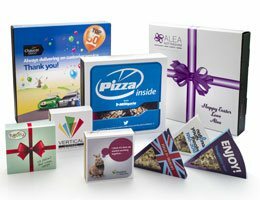 We have worked with many businesses over the last 10 years to create their very own unique set of corporate gifts complete with branding and personalisation, and have a plethora of happy clients to prove it. So let us take the hard work out of finding the right corporate gift for you by giving us a call on 0115 989 4254.